As the name suggests, the XEL is a long-wheelbase version of the XE compact executive saloon, which slots it right beneath the XFL and XJL. Recently spotted testing at a track, we can clearly see a longer rear door compared to the standard XE though exact measurements have not been released. MotorAuthority believes the size difference should be similar to what we’ve seen with the XFL, around an additional 6.2 inches in length compared to its XE sibling. The extra length should appeal to potential buyers in China, where having a driver on hand is not all that uncommon. 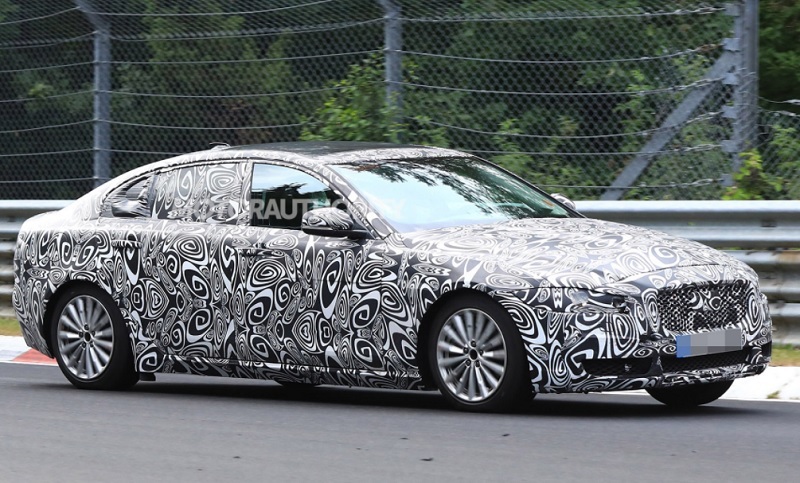 Aside from its length, there seems to be no other major changes to the vehicle’s design. Though we may see Jaguar switch from the less powerful engines offered with the regular XE because the turbocharged 2.0-litre petrol and diesel engines can only produce up to 247bhp and that may not be enough to move the longer chassis. We can also expect to see a few extra luxury interior features on offer including a rear infotainment screen, some kind of entertainment system, electric side window blinds, tables, and more. Expected to debut late this year or early next year at a major Chinese auto show, the XEL will not be sold outside of China. If this is the case then it might be safe to say that the upcoming E-Pace will also get a longer wheel base. Thought they would have left this up to the F-Pace to make this easier... China is a much more lucrative market than I thought! Additional 6.2 inches is quite the amount of length to add holy moly. That should have a seriously spacious interior when it comes to foot room especially. Although there is no word on if these will have reclining rear seats, that extra bit of space should allow that to become a possibility, along with the seat in front of it moving forward and the back rest tilting down. Front seat mobility isn't going to mean much at all considering the XE has ample front space and accommodates tall people. The rears I would hope recline, even in the slightest bit. Would be pretty cool to have a foot rest that comes up but obviously that won't happen as I don't even think entry level RRs have that lol. Would be pretty cool to have a foot rest that comes up but obviously that won't happen as I don't even think entry level RRs have that lol. On something that is extended like this with the extra foot room, it kind of seems like a waste if you don't have the foot rest there. What's the point of all the extra foot room?! So you can slide down the seat and slouch so that you're legs can be straighter and farther out? rear leg room isn't that great but with that extra leg room might be the ability to use things like a laptop table and have more room to swivel it around, with a regular XE that might not be nearly as comfortable to do. Waooo what A Beauty, love to see thanks for nice sharing.